Heat Advisory Today - Cooler and Wetter Next Week - Mother of all El Nino Events Brewing? "Ever tried. Ever failed. No matter. Try again, Fail again. Fail better." wrote Samuel Beckett. In life tenacity is everything, something Americans do better than most. As a young man Abe Lincoln went to war a captain and returned a private. He failed as a businessman. Winston Churchill failed 6th grade. Thomas Edison's teachers said he was "too stupid to learn anything". Albert Einstein did not read until he was 7. Henry Ford went broke 5 times before he succeeded. Michael Jordan was cut from his high school basketball team. Walt Disney was fired by a newspaper editor because "he lacked imagination and had no good ideas". Disney went bankrupt several times before building Disneyland. What made all these people great in the end? They never gave up. They kept pushing forward. They failed until they succeeded. Worth remembering if you're having a bad day/week/year. Never give up. Summer certainly isn't giving up - Yesterday was the hottest day of the year (94F in the metro with a heat index at or just above 100F). Mother Nature delivers another hot, wet kiss today with enough humidity for a heat index in the upper 90s. Hazy sun today gives way to T-storms Sunday with soggy, partly-puddly weather into Tuesday. Models are hinting at another thundery heat spike next weekend. Now that it's August, NOW we see 90-degree heat? * Images above courtesy of Wikipedia. Rare 90-Degree Days Emerge This Week. 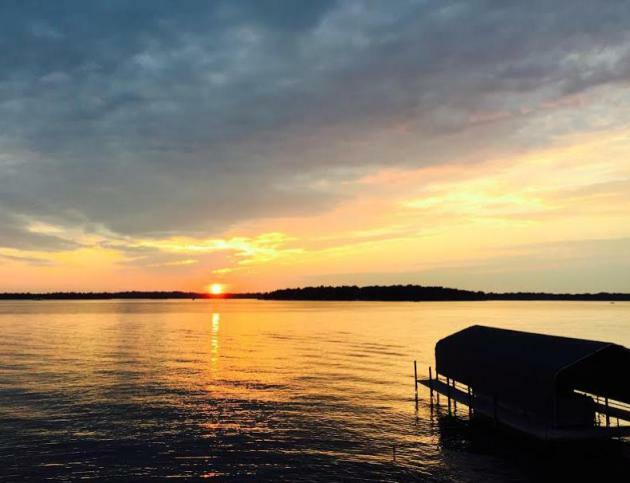 Here's a snippet from this week's installment of Minnesota WeatherTalk from Dr. Mark Seeley: "...For the summer of 2015 temperature readings in the 90s F have indeed been infrequent. 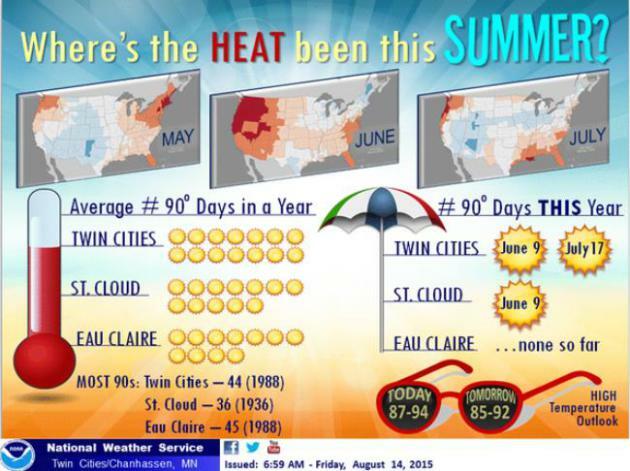 I have already commented about this feature in the Twin Cities urban heat island where there have been only two days with 90 F or higher temperatures this summer, compared to a historical average of 14 days. In other portions of Minnesota the same temperature pattern has prevailed..."
Federal Experts: Current El Nino Could Be "Historically Strong". Even stronger than 1997-1998? Perhaps. Here's an excerpt from Huffington Post: "...This definitely has the potential of being the Godzilla El Niño,” Bill Patzert, a climatologist with NASA’s Jet Propulsion Laboratory, told the Los Angeles Times. 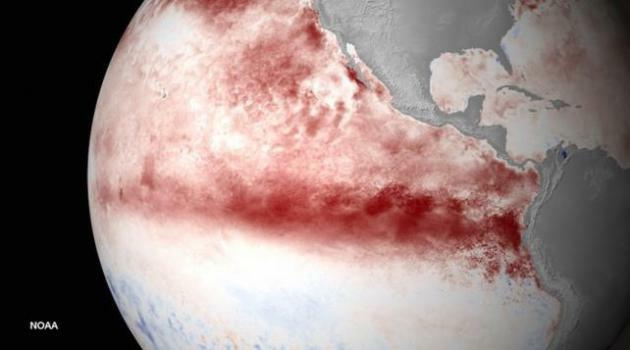 “Everything now is going to the right way for El Niño. If this lives up to its potential, this thing can bring a lot of floods, mudslides and mayhem.” NOAA's Mike Halpert said Thursday the current El Niño likely will rival past super El Niños in 1997-1998, 1982-83 and 1972-73. The most recent El Niño, beginning in 1997, caused the second-warmest and seventh-wettest winter since record keeping began in 1895. Weather around the country turned extreme, and severe flooding, ice storms and tornados raged from California to Florida..."
El Nino Could Rank Among Strongest on Record. Following up on the theme above, Climate Central has additional information and perspective; here's an excerpt: "...It’s possible this El Niño, which in the latest update was called “significant and strengthening,” could reach more than 3.5°F above normal in this ocean region, “a value that we’ve only recorded three times in the last 65 years,” Halpert said. That threshold was reached during the 1997-1998 event, as well as those from 1982-1983 and 1972-1973. But El Niño isn’t just about a feverish ocean — what matters to most people are the impacts to weather that those warmer waters can usher in around the world. The shift of warm water from west to east in the tropical Pacific causes changes in the circulation of the atmosphere overhead. These shifts in turn create a domino effect of altered atmospheric patterns across the globe..."
What Is El Nino? Climate Nexus has a very good explainer - here's a link and excerpt: "El Niño Southern Oscillation (ENSO) is a large-scale ocean-atmosphere interaction in the tropical Pacific Ocean. ENSO consists of oscillations between a warm phase (El Niño) and a cool phase (La Niña). Each phase typically lasts from nine months to a year, and occurs every three to seven years. The exact timing of ENSO events is difficult to predict more than a few months in advance, and we still don’t really know what factors might trigger El Niño and La Niña events. 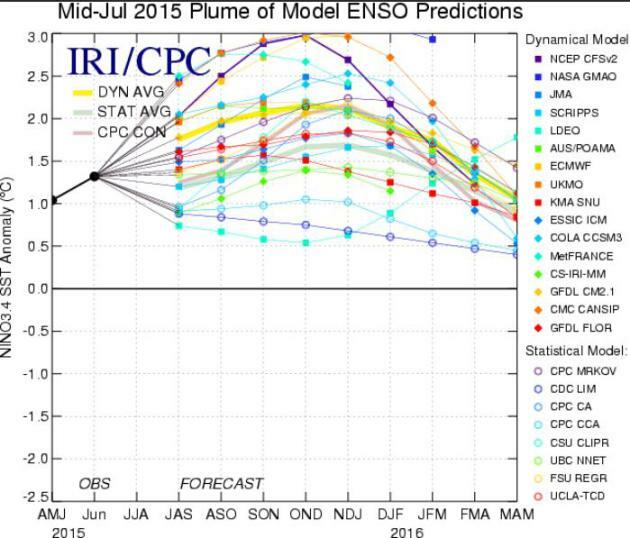 El Niño gets its start in ocean dynamics..."
Hottest July on Record Keeps 2015 On Track To Crush 2014 For Hottest Year. Here's the intro to an update from ThinkProgress: "NASA reports this was the hottest July on record. So we are now in “bet the mortgage” territory that 2015 will be the hottest year in NASA’s 125-year temperature record. In fact, 2015 is likely to crush the previous record — 2014 — probably by a wide margin, especially since one of the strongest El Niños in 50 years is adding to the strong underlying global warming trend..."
July was an average of 0.75°C above the 1951-1980 mean and is the hottest July on record. 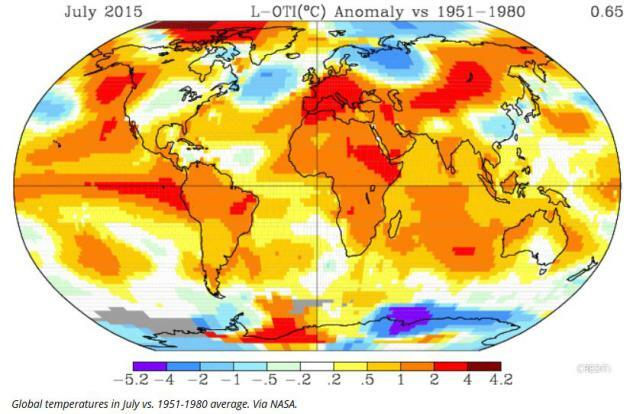 The only other month this year that's been hottest on record is now June with an anomaly of 0.79°C. The highest anomaly this year is now March at 0.9°C, which makes it the second hottest March after March 2010, at 0.92°C. 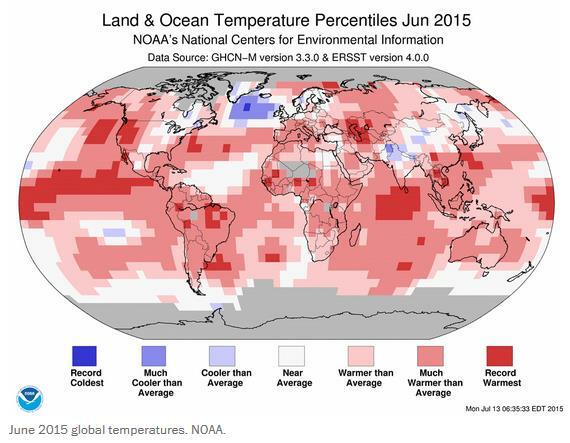 2015 is still hottest on record so far. 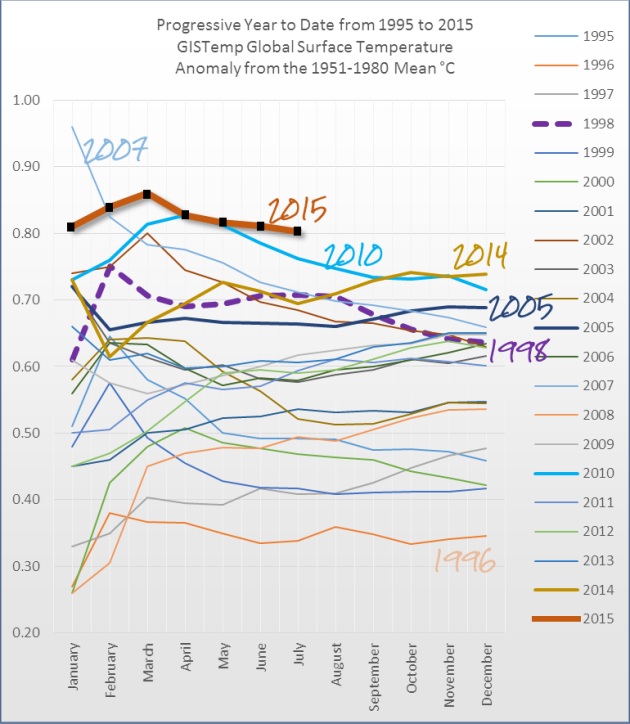 The lowest anomaly was in April this year, now 0.73°C above the 1951-1980 mean. It's So Hot in Texas That Shoes Are Literally Melting. That's not good - here's an excerpt from EcoWatch: "Summer is coming to an end but the relentless heat has not. Temperatures soared to 106 degrees in the city of Allen, Texas this week, causing a high school football player’s shoes to literally melt. 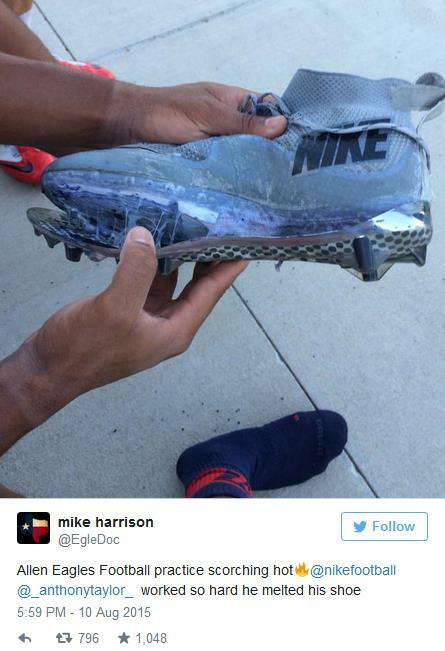 According to USA TODAY, Eagles defensive back Anthony Taylor’s Nike cleats melted during practice. The image above was captured by Taylor’s athletic trainer, Mike Harrison..."
* Deadly Heat Waves Sweep The Globe. EcoWatch has the details. Surge in "Danger Days" Just Around The Corner. Minnesota will be in better shape than much of the USA - one benefit of being a suburb of Canada. Connecting the dots, looking at the trends and models, Climate Central has produced an effective time lapse that shows where we may be heading; here's an excerpt: "...A danger day is when the combination of heat and humidity (also known as the heat index) make it feel like it’s 105°F or hotter. 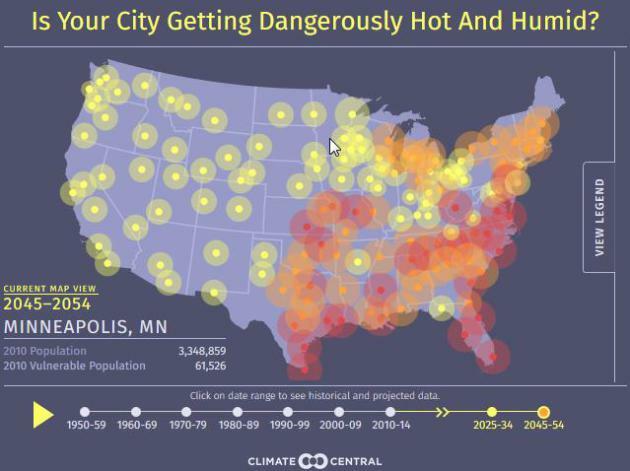 Warming temperatures are about to push U.S. cities into a new regime where danger days happen regularly. Of the 144 U.S. cities Climate Central analyzed, only 12 of them averaged more than one danger day per year since 1950. Most of those cities are clustered in the South where humidity tends to be worst in the morning while temperatures peak in the late afternoon. But by 2030, a whopping 85 cities — home to nearly third of the U.S. population -- are projected to deal with at least 20 danger days annually..."
Half and Half. Saturday will be the sunnier, hotter, drier day of the weekend, statewide. Dew points may not be quite as high as they were Friday, but with highs ranging from 90-93F it will still feel uncomfortable out there by afternoon. A slow-moving cool front sparks a few T-storms Sunday; a wave of low pressure rippling along the front triggering potentially heavy rains Sunday night. Soggy Stripe. 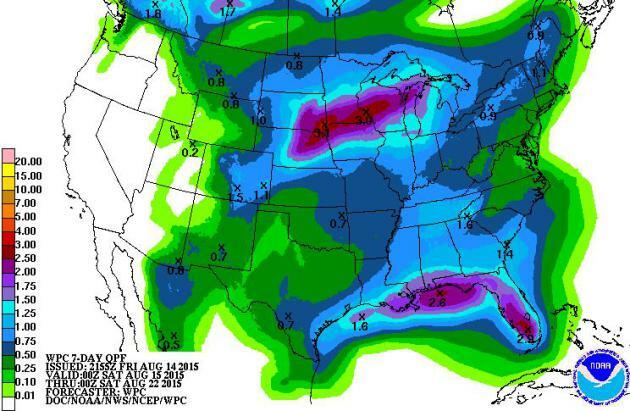 Latest QPF forecasts from NOAA's model ensembles print out a smear of 1-3" rains from near Sioux Falls to Mankato and Rochester, upwards of 1.5" for the Twin Cities. More heavy showers and T-storms spark spotty flash flood problems along the Gulf Coast into Florida. A Soggy Spell. Long range models show some heavy rains returning by midweek; I'm not buying the 5.82" of rain predicted by the GFS or even the ensemble value of 4.44" - but next week will be cooler and wetter; little doubt about that. Source: Aeris Enterprise. A/C Optional. After sweating it out for a few days a taste of September is on the way next week with a streak of days in the 70s; a few models even hinting at highs in the upper 60s by Wednesday and Thursday. 10 Years Later, Did We Learn Anything From Hurricane Katrina. 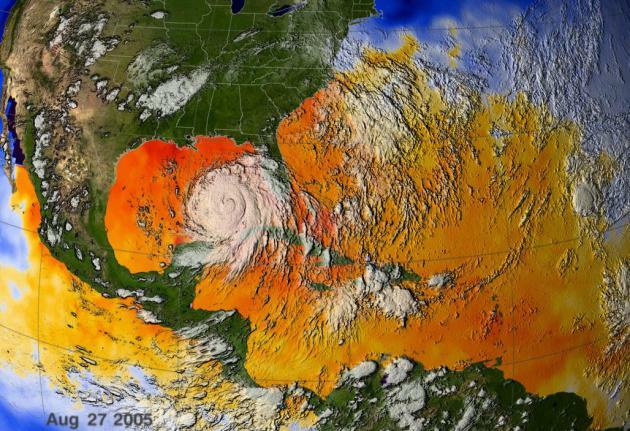 10 years ago we were tracking Katrina, which wound up costing the USA 1200 lives lost and $108 billion dollars in property loss. Here's an excerpt of a post from Marshall Shepherd at Forbes: "...The National Hurricane Center notes that since Katrina there has been: (1) Development of a prototype storm surge watch and warning system through a collaborative effort of NHC, National Weather Service, and National Ocean Service (2) Extension of National Hurricane Center forecasts from 3 to 5 days and extension of watches and warnings by 12 hours in 2010 to 48 and 36 hours, respectively, and (3) Improved track forecasts. These advances are critical because greatest loss of life comes from storm surge and flooding..." (Image: NASA). Extreme Weather Poses Risk of More Food Shortages, Civil Unrest. How will increasing weather volatility impact the food and water supplies of a rising global population? Here's an excerpt from Reuters: "...Rather than being a once-a-century event, severe production shocks, including food shortages, price spikes and market volatility, are likely to occur every 30 years by 2040, said the Taskforce on Extreme Weather and Global Food System Resilience. With the world's population set to rise to 9 billion by 2050 from 7.3 billion today, food production will need to increase by more than 60 percent and climate-linked market disruptions could lead to civil unrest, the report said..."
* The 20 page (PDF) report referenced above is here. Air Pollution Causes 1 in 4 Deaths in China, Over 4,000 A Day. Quartz has some amazing, horrifying statistics. Yes, by all means let's abolish the evil EPA, get rid of all regulations, and be just like China! Here's the intro: "China has long known it has a problem with air pollution, but a recent study has attributed a startling new death toll to the issue. 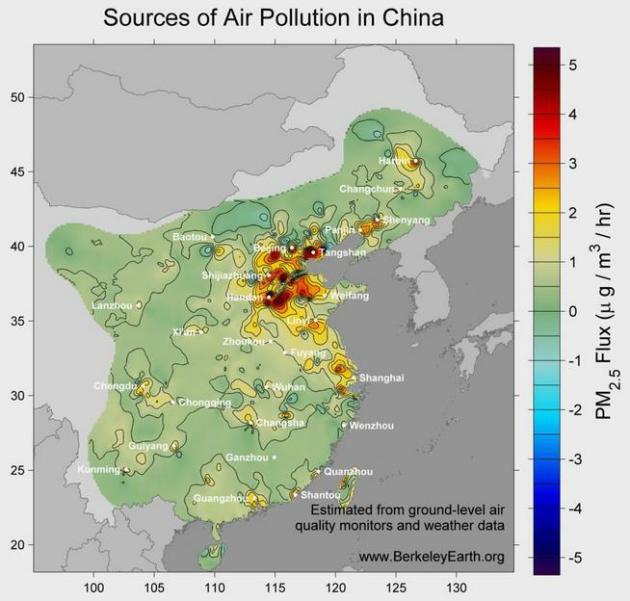 Berkeley Earth, a nonprofit that studies climate change and related issues, says 1.6 million deaths in China are caused by air pollution every year. That’s well over 4,000 per day, or 17% of all deaths. In its paper, to be published by the peer-reviewed journal Plos One this month, the organization also examines the sources of air pollution in China..."
* Bloomberg Business has more perspective on China's air pollution epidemic here. Beautiful Caribbean Beaches Now a Smelly Mess After Massive Seaweek Invasion. What is going on? The Washington Post reports; here's a snippet: "One of the Caribbean’s most important and alluring assets is in trouble. Beautiful beaches that, as the official tourism site for Barbados describes as “nothing less than perfect,” have become infested with a massive amount of smelly and decaying seaweed. 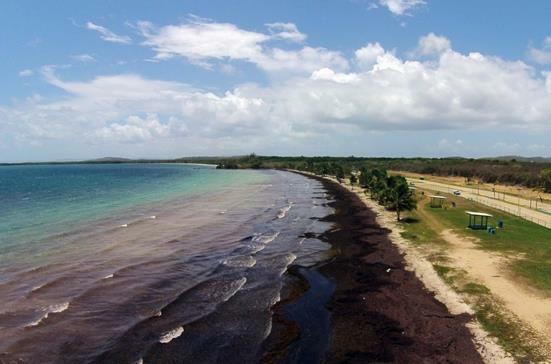 From the east coast of Mexico to Barbados, large clumps of the brown seaweed known as sargassum have been piling up, attracting biting sand fleas. In some cases, the seaweed piled up as high as 10 feet, the Associated Press reports..."
The Geeks Are Taking Over The Weather Channel. We are a nation of weather geeks, so I see this as a very good sign. Remember when "geek" was a slur? Now it's a compliment, at least among true, die-hard weather enthusiasts. Here's an excerpt of an Andrew Freedman story at Mashable: "The geeks are back at the Weather Channel, and they're ready to return the network to its nerdy roots. That's the message the network is sending with the new show, "Weather Underground TV," which will air five nights a week from six to eight p.m. eastern time, beginning on August 24. 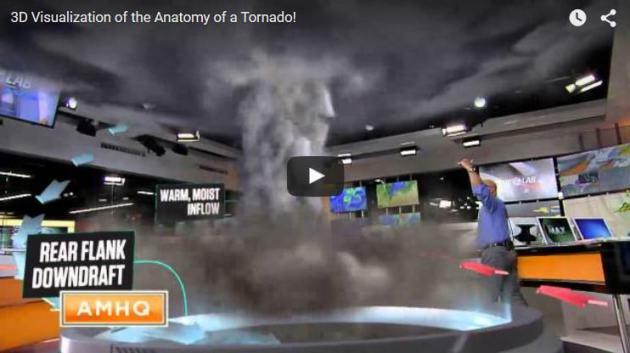 The network hopes there are enough weather geeks out there to justify the move and give them a ratings bump, after a long-term ratings decline and recent plateau in prime time viewership. This move comes as the network sees its audience increasingly turning to the Internet for weather information, including the company's own apps..."
How A New App Could Become Your Personal Energy Advisor. Available in Sweden but perhaps coming to the USA? 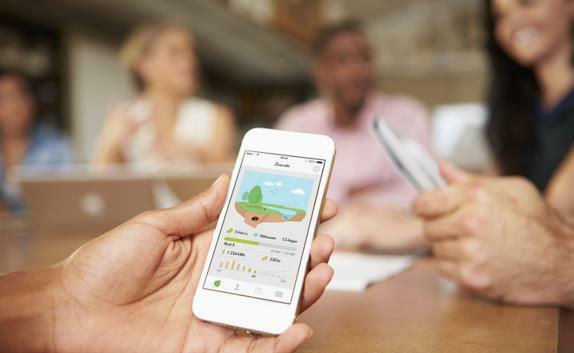 Here's an excerpt from businessGreen: "A new app will soon help Swedish households reduce their carbon footprint and energy bills by providing personalised advice to curb their energy usage. 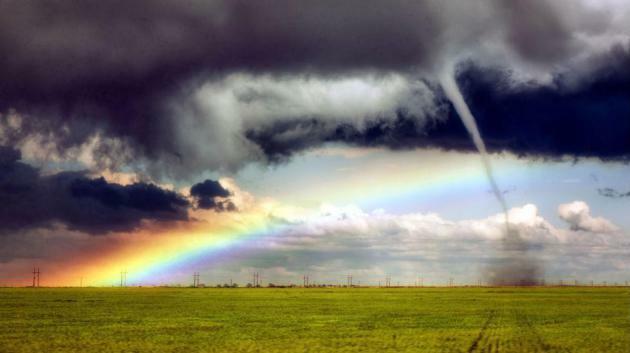 'The Energy Tree' will be rolled out to over 200,000 Swedish households, developer Greeneley announced yesterday, after it partnered with SBAB Bank to offer the app to its mortgage customers..."
Once In A Lifetime Shot: A Tornado and a Rainbow. In my 40+ years tracking weather I can't remember ever seeing a photo like this. Spectacular is a serious understatement. Details via The Weather Network: "...On a cloudy day in May, amateur meteorologist Jason Blum captured a once-in-a-lifetime shot, featuring two very different atmospheric phenomena in the same frame. Blum was on a storm chase near Eads, Colorado with his 14-year-old son when they found themselves less than a kilometre away from a tornado and a rainbow . "What I love about storms is their power," Blum says in a press release..."
Can A Blizzard Cause A Baby Boom? A Buffalo Hospital Says Yes. The Hamilton Spectator has the curious details; here's a clip: "This past November, a pair of freak snowstorms dumped a historic 70 inches of snow on the area around Buffalo, N.Y., in a matter of five days. Now a Buffalo maternity ward is dealing with a different kind of blizzard. Officials at Mercy Hospital told the Associated Press they've seen a "mini baby boom," as the AP described it, almost exactly nine months after the "Snowvember" storm. You know, those nine months..."
Photo credit upper right: Melanie Griffis, AP. "Stephanie and Jason Brueggeman hold their newborn daughter at Mercy Hospital of Buffalo in New York, nine months after a “Snowvember” storm snowed them in." 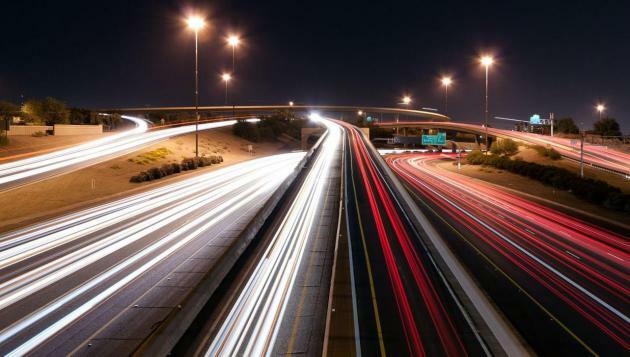 Roads That Can Charge Your Electric Car As You Drive May Arrive Sooner Than You Think. Expect innovations that sound like science fiction today; here's an excerpt from Quartz: "...Wireless charging technology already has been proven to work, both in phones and buses. South Korea has a 12-kilometer road that charge buses as they drive. The wireless technology that vehicles use is called SMFIR—it stands for shaped magnetic field in resonance—which involves the transfer of electric charge via magnetic fields that are generated and captured by coils installed in the road and car respectively...."
Photo credit above: Alan Stark/Flickr CC-BY-SA. Tech's Enduring Great-Man Myth. For the record I'm an Elon Musk fanboy. He could have taken his Paypal money and bought a small island (OK, a big island) in the Caribbean and been set for multiple lifetimes. He didn't - he plowed it back into a series of risky ventures, almost failed, but kept going until he succeeded on a massive scale, with Tesla, Solar City and SpaceX. 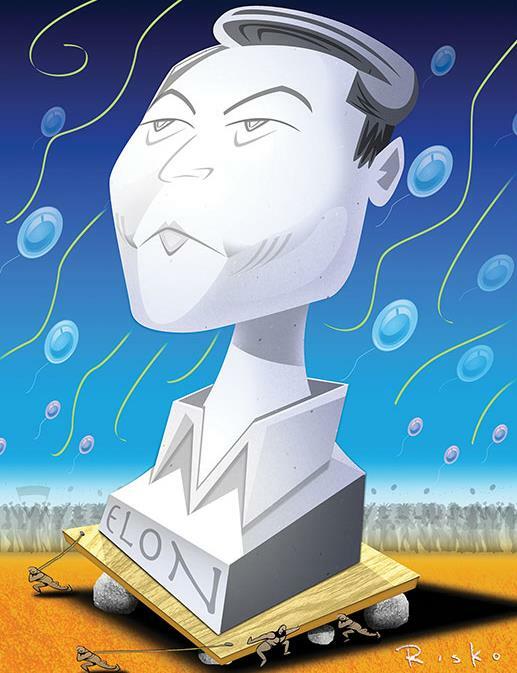 I don't buy into the theme of this story at MIT Technology Review, but in the spirit of full disclosure here's a link and excerpt: "Since Steve Jobs’s death, in 2011, Elon Musk has emerged as the leading celebrity of Silicon Valley. Musk is the CEO of Tesla Motors, which produces electric cars; the CEO of SpaceX, which makes rockets; and the chairman of SolarCity, which provides solar power systems. A self-made billionaire, programmer, and engineer—as well as an inspiration for Robert Downey Jr.’s Tony Stark in the Iron Man movies—he has been on the cover of Fortune and Time. In 2013, he was first on the Atlantic’s list of “today’s greatest inventors,” nominated by leaders at Yahoo, Oracle, and Google. To believers, Musk is steering the history of technology..."
Why "Sesame Street" Is Moving to HBO. Variety has the story behind the story. But will Big Bird show up on Game of Thrones? That could work. Here's a clip: "You might say “Sesame Street’s” newest move is being brought to you not by a letter or number, but by a symbol: $. 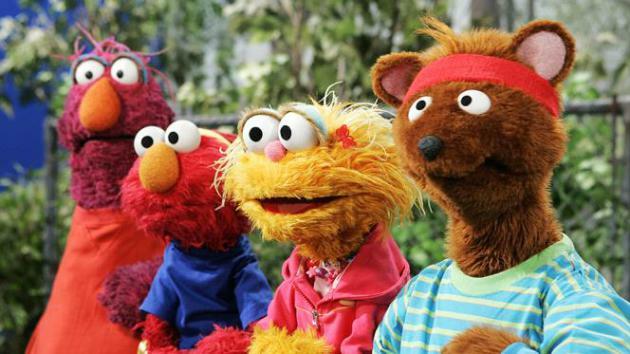 If the show’s production company, Sesame Workshop, didn’t find a new way to win financial support for the venerable kids’ program, it would not have been able to continue in its mission of educating children the way it has since 1969. “The current path we were walking on wasn’t going to work,” explained Steve Youngwood, chief operating officer of Sesame Workshop, in an interview Thursday afternoon..."
Photo credit: Kaufman Astoria Studio. The Midwest, Home Of The Supermodel. The Atlantic confirms what we already knew; here's an excerpt: "...So why has flyover country been so fruitful for the Clarkes? It boils down to two secret ingredients of the modeling business: plenty of height, and just the right amount of competition. The fashion world has become more open to models of different sizes and ethnicities in recent years, but it still clings to one, unshakable standard: You have to be tall. Female models on the “short side,” Clarke says, are still at least five-foot-nine. One theory, which Clarke heard from a fellow scout, is that the Midwest is home to a disproportionate number of people whose ancestors were the vertically gifted Northern Europeans..."
Photo credit above: "Illinois native Karlie Kloss poses for photographers." Gonzalo Fuentes / Reuters. The Longest Commercial Flight In The World? 17 hours and 35 minutes? That's a lot of peanuts. Huffington Post has the details: "... 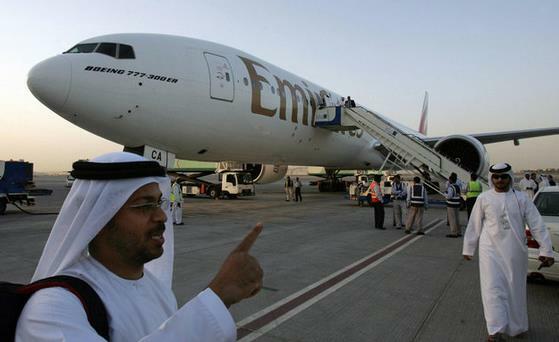 The Middle East's biggest airline will soon be operating the world's longest commercial flight. Emirates announced plans Thursday to begin daily roundtrip flights between its Dubai hub and Panama City, its first destination in Central America. It says the 17 hour, 35 minute flight when heading west will be the longest anywhere..."
Airline To Weigh Passengers Before Boarding - Travel Hits New Low. I'm feeling even better about flying Delta. Huffington Post has the gasp-worthy details: "As if air travel couldn't get any worse, Uzbekistan Airways announced on its website Friday that the carrier will be weighing its passengers before they step on the plane. Prior to boarding, the airline says, staff will "suggest" travelers use the "special weighing machine" in the gate area in the name of "ensuring flight safety."..." 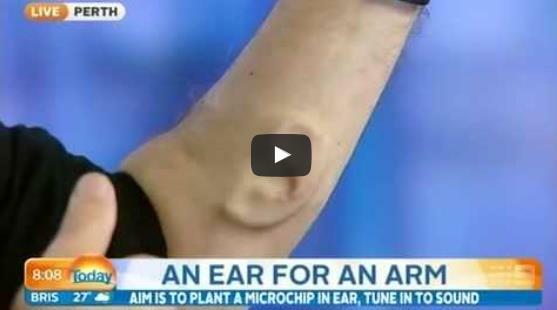 Australian Artist Has Ear Growing Out Of His Arm. "Can you hear me now?" News of the freakish - sorry. The headline grabbed me and I had to include this - what is in the water Down Under? I'm all for ink and I sort of understand piercings but let's hope this doesn't catch on. Huffington Post has bizarre story; here's a clip: "...For the last nine years, the artist known only as Stelarc has been growing a third ear on his left arm, all in the name of art. "As a performance artist I am particularly interested in that idea of the post-human, that idea of the cyborg," he said, according to CNN. "What it means to be human will not be determined any longer merely by your biological structure but perhaps also determined largely by all of the technology that's plugged or inserted into you...."
94 F. high temperature in the Twin Cities Friday. 72 F. peak dew point at KMSP yesterday. 81 F. average high on August 14. 80 F. high on August 14, 2014. August 15, 1936: St. Paul swelters with a high of 108. Fossil Fuels are Doomed. It won't happen overnight - but a combination of factors is already transforming the energy sector. Why so much "debate" about climate science? 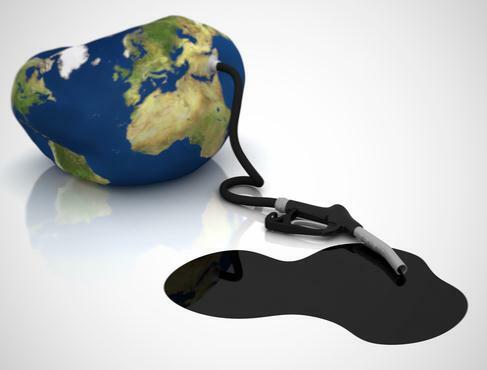 There are trillions of dollars of coal, oil and natural gas still in the ground, and some of the richest corporations on the planet want to be able to harvest those dirty fuels. Fading industries are fighting to maintain market share, and a little confusion in the marketplace can serve their interests. It's a threat - and a massive opportunity to reinvent our energy ecosystem. Here's an excerpt of a story at US News: "Sure, dystopia may be just around the corner. We may, in fact, be doomed – as climate change begins to accelerate mass species extinctions and threatens critical water and food supplies - but I wouldn't bet against the human race. We are in the midst of an economic transformation unparalleled in the world's history. It's happening so quickly, and at such scale, that it's almost beyond recognition to most people. It's enmeshed in deep, polarizing, conspiratorial political fights, further obscuring its rise. Dozens of the wealthiest corporations in the history of the world – and government leaders at their beck and call — are bitterly opposed to this transformation, and are determined to deny it..."
We Need a Miracle on Climate Change. Here's an excerpt of an Op-Ed from Michael Gerson at The Washington Post: "...There was no way to get to the moon by stacking ladders. That required an entirely different technology. Current environmental responses are the stacking of ladders. “We need breakthroughs,” says Gates. It is sobering when your only sufficient policy response is the production of a miracle. But I’ll add a few more depressing political and economic factors. Human beings are fairly good at calculating costs into their decision-making — saving for a rainy day, buying car insurance — if the time horizon is a few months or a few years. They are not as good at assuming burdens, as in environmental policy, when the time horizon is a few decades or centuries..."
Is The Global Warming "Hiatus" Over? El Nino and the PDO can mask the larger signals related to greenhouse gases, but there's little doubt the atmosphere and oceans continue to warm. Here's a snippet of a timely story and links to research from NCAR's Kevin Trenberth at The Conversation: "...While the rate of surface temperature increase has been mostly upward from about 1920 and the recent rate is not out of step overall, there are two hiatus intervals with much lower rates of temperature increase. The first was from about 1943 to 1975, and the second was from 1999 to 2013. 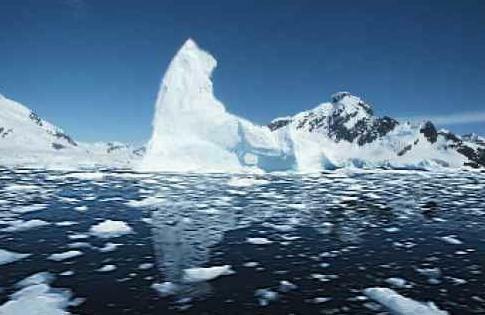 In a paper entitled Has There Been a Global Warming Hiatus?, I find that natural variability through interactions among the oceans, atmosphere, land and ice can easily mask the upward trend of global temperatures. For climate scientists to improve climate models, better understanding of these variations and their effect on global temperatures is essential..."
Graphic credit above: "Seasonal global mean surface temperatures from NOAA, after 1920, relative to the mean of the 20th century. The seasons are defined as December-February, etc. A 20-term Gaussian filter is used to show the decadal variations (heavy black curve). 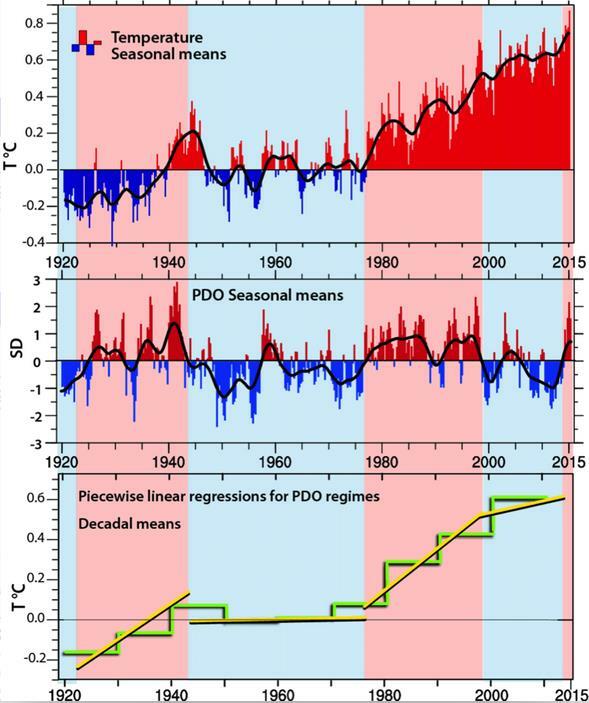 (middle) The seasonal mean Pacific Decadal Oscillation (PDO) anomalies, in units of standard deviation. The positive (pink) and negative (light blue) PDO regimes are indicated throughout the figure. (bottom) Decadal average anomalies (starting 1921-1930) of GMST (green) along with piecewise slopes of GMST for the phases of the PDO (yellow). Kevin Trenberth/Data from NOAA, Author provided." If There Really Was a "Pause", the Atmosphere Just Hit Play. Here's a clip from a Washington Post story authored by Chris Mooney: "...Not that any of this is good news for skeptics — Trenberth says that the warming trend seems to have since resumed, that temperatures rose in 2014, and that they are spiking even more this year. He expects that global warming advances “more like a rising staircase than a monotonic rise” — and has previously suggested that we’re in the middle of a “jump” in temperatures. The debate matters, though, because Trenberth wants to people to see that there really are major natural wobbles that will always prevent the global temperature rise from simply being a linear one..."
Green Groups: Arctic Drilling "Inconsistent" with Obama's Climate Change Crusade. Here's an excerpt from fuelfix.com, courtesy of The Houston Chronicle: "The Obama administration’s fight against climate change is undermined by Shell’s quest for new oil reserves in the Arctic Ocean, environmentalists warn in a report Thursday. The ongoing Arctic drilling is “inconsistent” with efforts to stay within a global carbon budget by limiting fossil fuel use and restraining greenhouse gas emissions to keep global warming to less than 2 degrees Celsius, according to the assessment. “If we are serious about tackling the global climate crisis, we need to stop exploring, expanding and ultimately exploiting fossil fuels,” says the report from Greenpeace and Oil Change International, which promotes a transition to alternative energy sources..."
Trending Cooler and Wetter - Brewing El Nino May Be "Historic"